Electronic books are quickly rising as the medium of choice for reading, and the iPad is there let you into the world of e-books. The book-related iPad apps discussed below can keep your (and your kids) reading for years to come. With Audiobook Player HD, you can easily find, download, and listen to thousands of free audio books. It also offers several ways to browse or search for titles that interest you. One of the best things about Audiobook Player HD is that (unlike the audiobooks you purchase from Audible.com) you can download free audiobooks one chapter at a time, which helps you conserve storage space on your iPad. Although the 2,300 free books include classics in the public domain, there are few (if any) available audiobooks written during your lifetime. If you’re looking for current bestsellers or more contemporary fare, the iTunes Store’s Audiobook section has a pretty good selection. 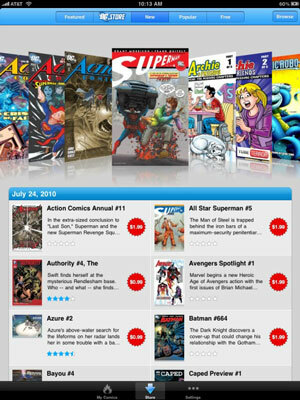 The Comics app is a front-end to the largest comic book library online, offers a ton of free content, and provides a well-designed interface that makes viewing comics on a small screen more pleasant than other comic book–reader apps. The free Comics app lets you download dozens of free comics when you first launch it, and more freebies are added every week. To find comics — free or paid — just use the Comics app’s excellent in-app comic store, which offers thousands of comics and series and generally lets you download the first issue in a series for free to see if you like it enough to buy subsequent issues. Stanza is another free eBook reader with more and better features than the Kindle app but a significantly smaller selection of titles. Some of Stanza’s niceties include almost infinite control over page layout, so you can specify not only font size but also margins, line and paragraph spacing, indentation, page color, and more, some of which are shown in the figure below. Best of all, Stanza has a set of fabulous built-in catalogs, so you can find and download free content and purchase contemporary books without leaving the app. Stanza offers titles from multiple sources, including Random House Free Library, Harlequin Books, and all 25,000+ books from Project Gutenberg. The name says it all . 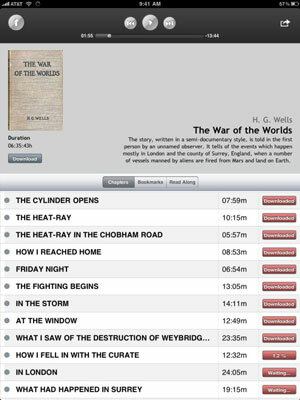 . . this app lets you download and read 23,469 classic books. There are other apps that offer similar content, but if you’re looking for a free app that does nothing but offer you free reading material — novels, autobiographies, letters, plays, poems, and more — look no further. 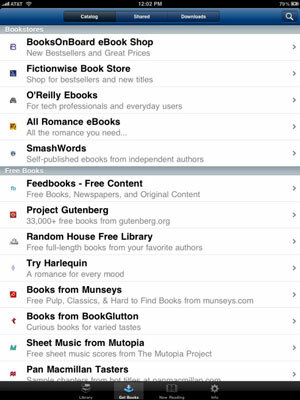 With its well-organized collections of various types of literature, Free Books makes it easy to find something good to read, easy to download what you’ve found to your iPad, and easy to enjoy reading it on Free Books’ simple, uncluttered interface. iBooks lets you use your iPad to browse, search for, and purchase books from Apple’s iBookstore. Book pricing is similar to that of Kindle books, but the iBooks selection is much smaller. But iBooks offers easy and convenient management of screen brightness, font size, and typeface. It has a comprehensive search feature, highlighting, and note-taking — and it can read PDF documents, as well as iBooks. If you’re a fan of the Bard, you’ll love this free app, which includes the full texts of 40 plays, all 6 poems, all 154 sonnets, and a searchable concordance. Produced in part by PlayShakespeare.com, which is known as “the ultimate free Shakespeare resource,” the works in this app are drawn from the First Folio of 1623 (and the Quartos, where applicable) as well as the Globe Edition of 1866, re-edited and updated. If you really like Shakespeare, you can upgrade to the “Pro” version, which adds portraits, a glossary, quotes, facts, and scansion. Wattpad promotes itself as the world’s most popular e-book community and a place for readers and writers to discover, share, and connect. Where other apps feature previously published works, Wattpad is all about the unpublished works of fledgling authors. The interface for searching and browsing is well designed, and you can cast votes, provide feedback, share with friends, and become a fan.